Harbor Tour I HeartofHamburg-Tours I now discover the port of Hamburg! The Classic among our city tours in Hamburg. Discover with us the port of Hamburg from inside. Experience with us other highlights along the river Elbe in a unique perspective and from new angles in our 2 to 3.5 hour individual harbor tour. 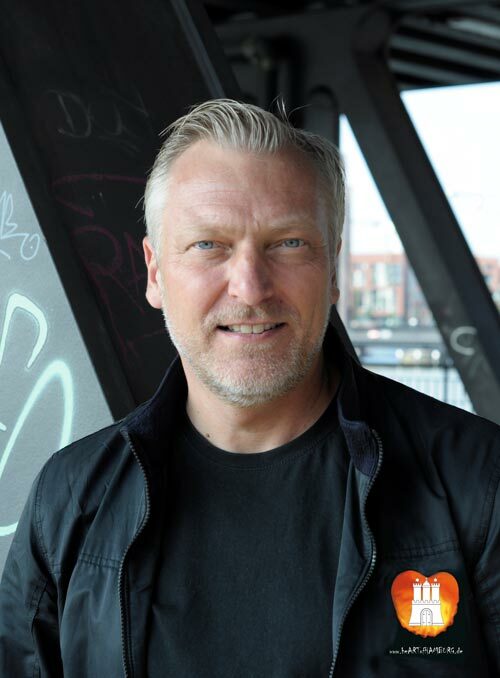 Guided by your personal and certified local guide Johannes Pickert, apart from mass tourism. Immerse yourself in the maritime atmosphere of the port of Hamburg together with us. Experience the old Warehouse District which belongs to Unesco Heritage, the gigantic panoramic view from the Plaza of the Elbphilharmonie, the new Hafencity and the harbor in all its dimensions during this exclusive sightseeing tour. Get a lot of background knowledge about the urban history with approximate 8 people in our air-conditioned van. We look forward to welcome you and to make you a personal offer! Johannes Pickert, your personal guide he shoots the breeze and will give you some real details about Hamburg and the real North on its exclusive and individual city tours. Already in 2005, after showing for 10 years as an actor his talent, Johannes opened his gallery HeartofHamburg in the heart of Eppendorf, and offered there his photographic art work also for 10 years. 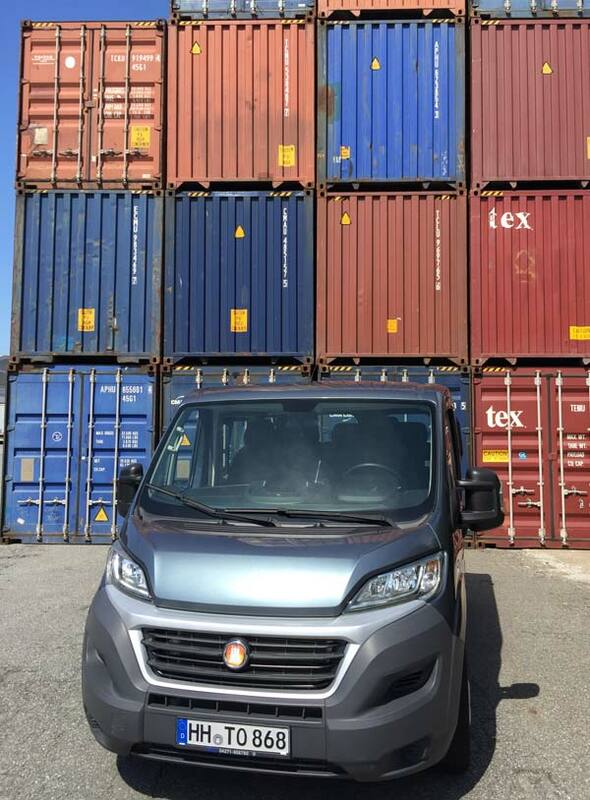 balm for the soul, only horizon, out of the city and all this in the spacious Fiat Ducato with up to 8 passengers, maneuverable as a car, generous in space and authorized by the Authority for economy and Transport Hamburg. Experience the uniqueness of Hamburg and the coast with HeartofHamburg-Tours. Our insider know how is your profit. 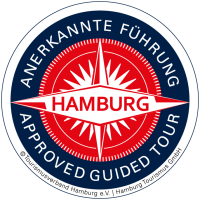 Company certified by the Hamburg Tourism Association. Certified Plazaguide. Do you have requests for individual day trips or sightseeing tours of Hamburg? Starting point of our tours when not picking up at the hotel or place of your choice is in front of Kehrwieder 12 in Hamburg. Here you will find answers to the most frequently asked questions about our tours. Pick up at the hotel, at the airport or a place of your choice!? Of course we pick you up at a place of your choice, from then on the journey begins! You can easily pay by mobile payment with Giro or credit card to our driver! HeartofHamburg-Tours does not accept any liability for your personal items during the tours! Kids are welcome, we have the prescribed seat increases on board for a height of up to 150 cm or an age to 12 years! If ´ s Nich, except in case of force majeure, we drive, sit in the dry and have umbrellas for the landings! Yes we offer also English guided tours! It's a pleasure. You have no internet to reserve and/or no plastic money to pay for? No problem! Call us, lashing your tour date with us by phone and pay at the driver's site or in advance by bank transfer! Maximum number of participants per tour? We have a maximum of 8 passengers seats per tour. Yes we offer transfers from A to B for approximate 8 people and baggage. For requests please contact us. Do we offer walking tours? 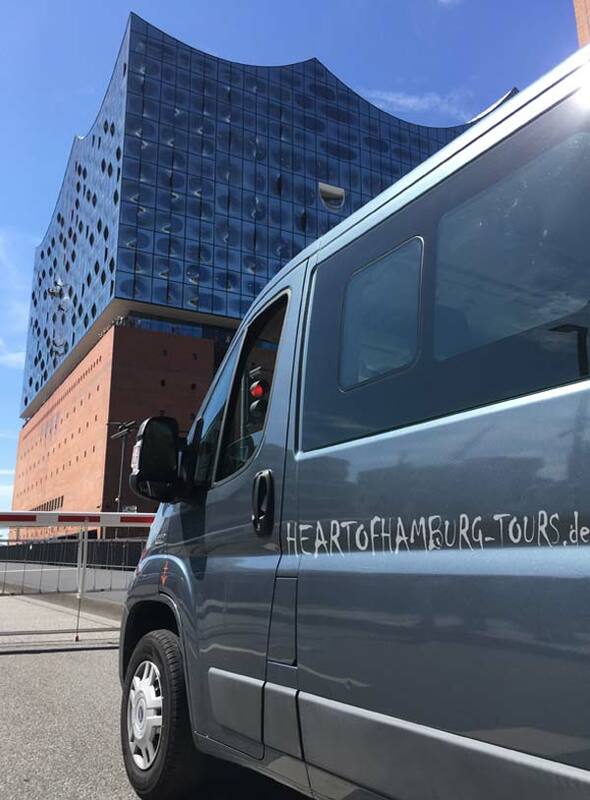 Yes we offer walking tours though the heart of Hamburg and the Plaza of Elbphilharmonie from 1 to 25 guests per tour. Choose the tour that best suits you and your Hamburg plans.